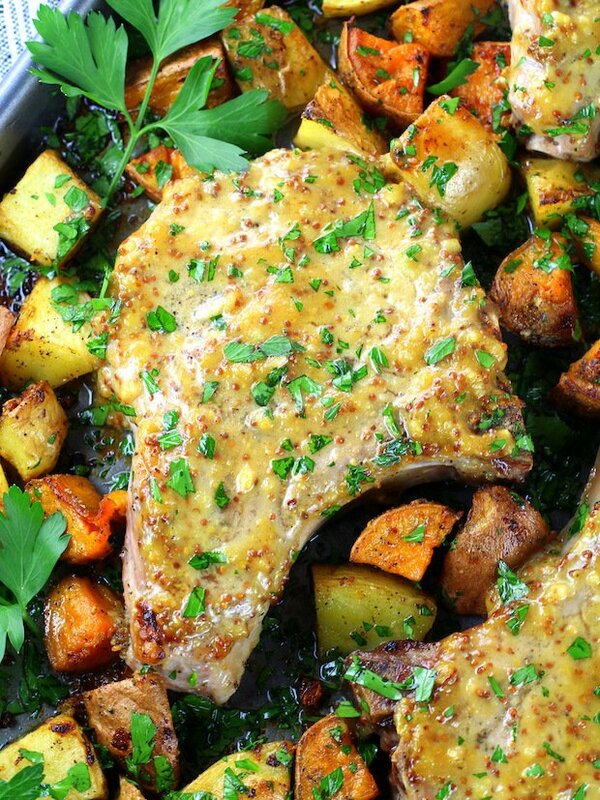 These Baked Pork Chops with Honey Mustard Sauce are tangy and sweet and downright scrumptious! 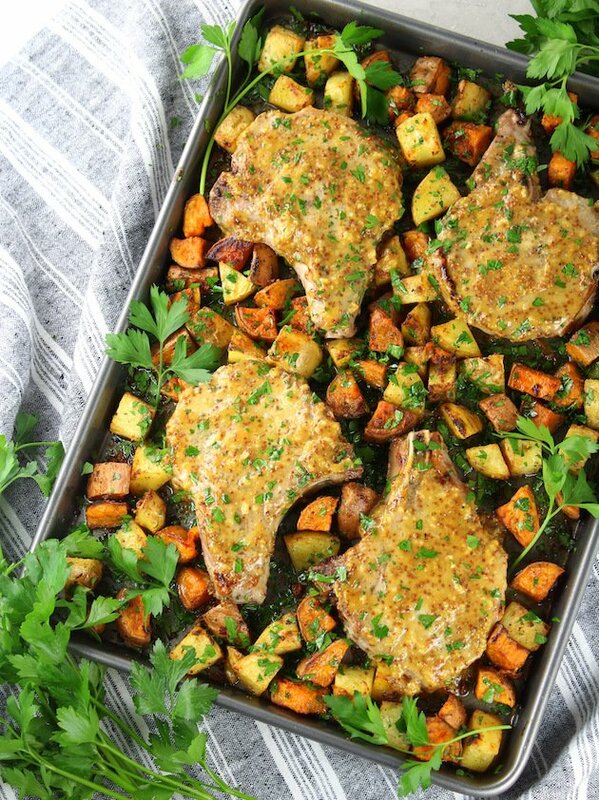 With bone-in center cut pork chops, Dijon mustard, stone ground whole grain mustard, minced garlic, roasted sweet potatoes and Yukon gold potatoes… this great recipe is ultimately a delicious and well-balanced sheet pan meal! Do you ever cook something and then you’re surprised by how much you enjoy it? This happens to me all the time. Probably because I’m trying out and testing new recipes so much. And that’s basically what happened with these Baked Pork Chops! They’re hearty and juicy with the most delicious sweet and tangy sauce! I know you’re gonna love them just as much as you love my One-Pan Parmesan Pork Chops with Asparagus! I don’t know about you but it’s been a long time since I’ve had honey mustard sauce. I remember back in my college days there was a local restaurant chain that served the best chicken tenders with the most delicious honey mustard sauce. I’m sure there was nothing healthy about them – just some delicious crispy fried comfort food! Mmm, mmm! Well, let’s get to it – shall we? 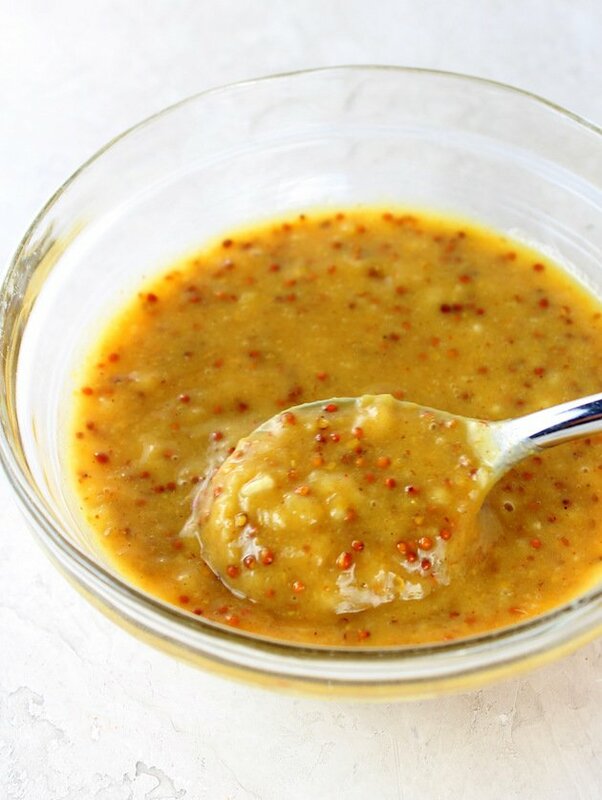 How do you make honey mustard pork chops? 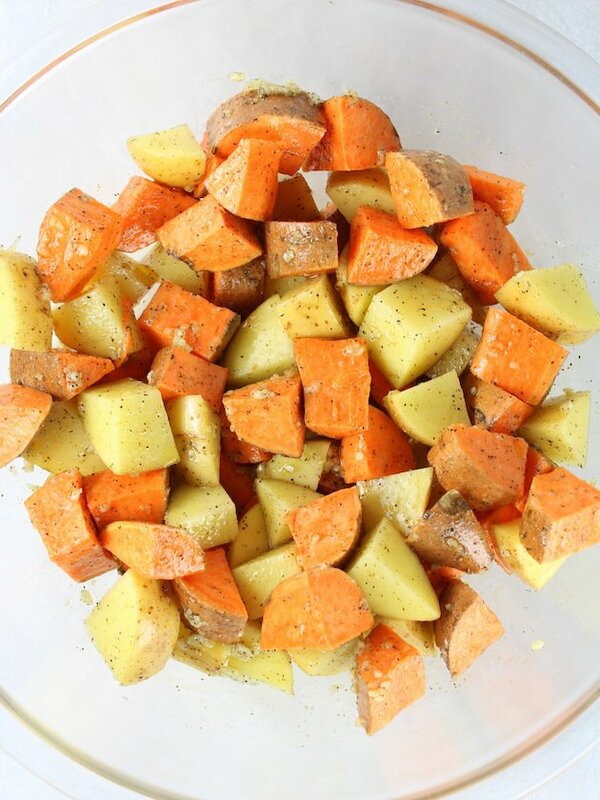 I went ahead and added some sweet potatoes and Yukon gold potatoes to this yummy dish. They bake in the oven for a bit before the pork chops are added to the pan. All in all, making this one well rounded and delicious sheet pan pork chop meal! 1) First off, go ahead and adjust the oven rack to the center position and preheat it to 450°F. 2) In a large bowl add cubed potatoes, season them with salt and pepper and toss them with the minced garlic and oil. Place them on a baking sheet and bake for 15 minutes – gently toss at 8 minutes so they don’t stick to the pan. 3) While those bake, season the 1-inch thick pork chops on both sides with salt and pepper. Then mix the honey, mustard and garlic in a small bowl and spoon half of the mixture just on the top of the pork chops. 4) Remove the pan with the potatoes from the oven and drizzle 1 more tablespoon of oil around the pan. Gently, turn a spatula upside down and use the flat edge to release any potatoes that are stuck to the pan. Then make four 5×5 inch wells and add the pork chops to the pan with the honey mustard side up. 5) Bake the pork chops and potatoes for 10 minutes. 6) Then leave the pan in the oven, turn the broiler to high, and cook pork chops for 2-3 minutes. You may be wondering “How do you know when the pork chops are done?” If you temp the chops in their center the internal temperature should reach an internal temperature of 145 degrees -160 degrees. Pro tip: You can safely eat pork at a lower internal temp than chicken. Many people overcook pork and it becomes very tough and chewy. 145-160 is the suggested temp for pork chops. And yes – you definitely need a digital meat thermometer <– this one is my favorite. 7) When the pork chops are completely baked remove the pan from the oven. Serve the chops with more sauce spooned on top and garnish with fresh chopped parsley. I honestly drooled on myself while I was typing this out. 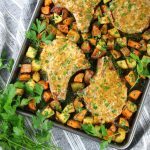 I really love this well-balanced tangy and sweet oven baked pork chop recipe… and I’m sure you’re going to love it as well. 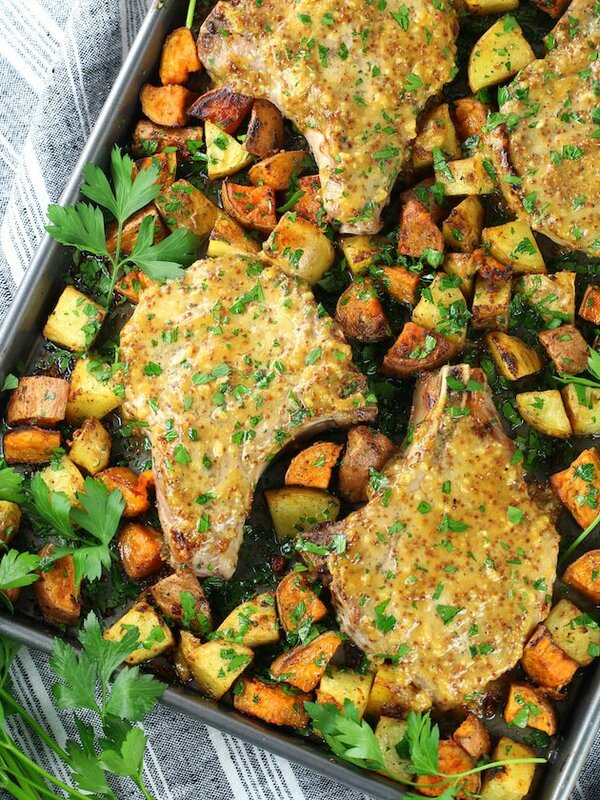 These Honey Mustard Baked Pork Chops with Roasted Potatoes are one easy and delicious well balanced meal! Enjoy my friend! 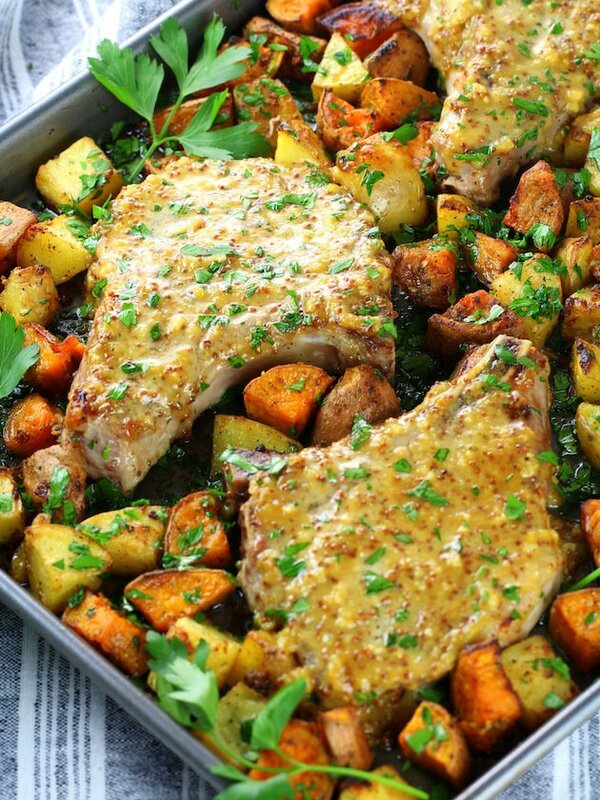 Baked Pork Chops with Honey Mustard Sauce - tangy and sweet and downright scrumptious! Bone-in center cut pork chops, Dijon mustard, whole grain Dijon mustard, minced garlic, roasted potatoes. Adjust oven rack to the center position. Preheat oven to 450°F. Add cubed potatoes to a large bowl, season them with salt and pepper then toss then with the minced garlic and oil. Roast potatoes on a baking sheet for 15 minutes – gently toss at 8 minutes so they don’t stick to the pan. Meanwhile season pork chops on both sides with salt and pepper. 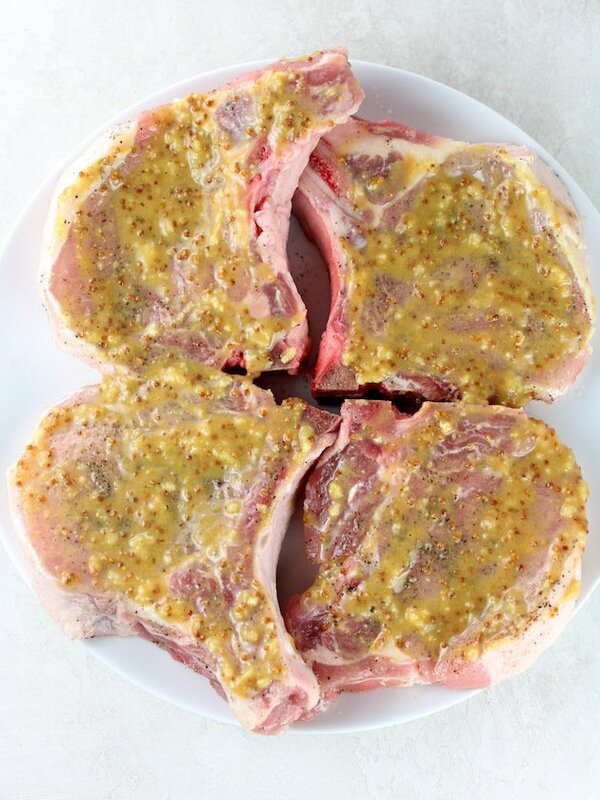 Then mix the honey, mustard and garlic in a small bowl and baste ½ of the mixture on the top of the pork chops. Remove potatoes from the oven and drizzle 1 more tablespoon of oil around the pan. Gently, turn a spatula upside down and use the flat edge to release any potatoes that are stuck to the pan. Then make 4 5x5 inch wells and add the pork chops to the pan with the honey mustard side up. Roast pork chops and potatoes for 10 minutes. Then leaving the pan in the oven turn on the broiler to high and broil for 2-3 minutes. The pork chops' internal temperature should reach 145-160 degrees. Spoon on more sauce, garnish with parsley and enjoy! The pan does get some burned bits on the bottom. 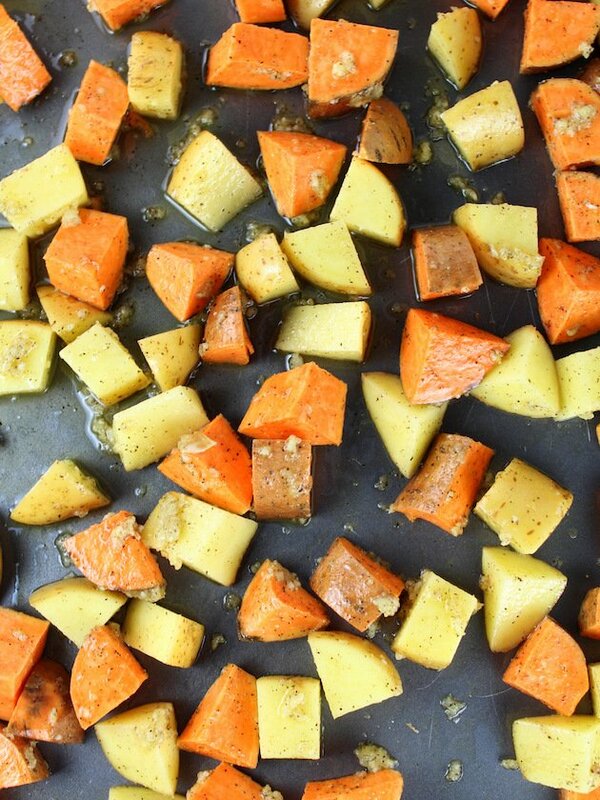 For easier cleanup line your baking sheet with parchment before roasting your potatoes. Leave the skin on the potatoes for this recipe, but make sure you scrub them thoroughly. This recipe will also work great with boneless pork chops! Thanks so much! This is one delicious meal! oh my goodness these pork chops looks amazing. I am always looking for good dinner recipes and this looks like it would be right up my alley. That’s great to hear, Kallee! Thanks so much!